While we would have preferred the 'Cooked' was in the same font as the 'Kettle'. This would have meant it would not have conflicted with the orange background of the main body. 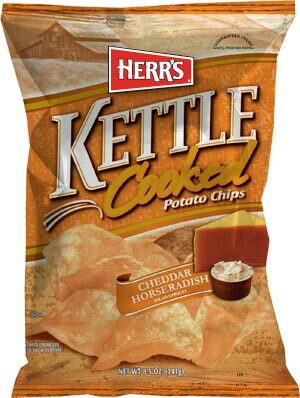 Also, the orange of the Cheddar color coding clashes a bit with the Herr's sepia heritage background. The lump of cheese also appears to be swimming in thin air - the flavor part of the bag design should be provided more prominence and given its own stand-out part of the bag. These Chips seemed smaller than many Kettle Cooked Chips, but a firm, crisp crunch was still available. The doubled over Chips were obviously better for crunching through, but they did not melt in mouths as quickly as regular Chips. A good quality Kettle Cooked Chip texture. These Chips were thick enough, though not as thick as many Kettle Chips, but still rigid and firm. There were some oil bubbles on the surface, but not many broken ones, which again emphasises sufficient thickness. There was a hint of orange powdery seasoning visible and the edges were curled, bent, misshapen and with potato skins visible. The flavor geniuses that toil over boiling pots of ingredients to bring us the World's favorite snack food, have managed to create this odd flavor pairing. With liberal seasoning that varied, darker ones appeared to taste more strongly and the lighter ones were a bit more cheesy. If there was any cheese it seemed somewhat overpowered. Horseradish is traditionally served with beef. It is as spicy as most peppers and leans more towards Japanese Wasabi. This was hotter than most hot Chips, but because so many were overpowered by this heat the cheesiness took a back seat. It could have been called Horseradish with a hint of Creamy Cheddar.